How people use marijuana is changing fast: Shatter, BHO, Kief, Vape Pens, Dabbing...It’s time to go Beyond Buds. Below are some key concepts from my upcoming book Beyond Buds, Next Generation: Marijuana Concentrates and Cannabis Infusions co-authored by Greg Zeman. Carbon dioxide or CO2 is a naturally occurring element; normally, it comprises 0.039% of the air we breathe and is the central fuel of the photosynthesis process plants use to stay alive. Most of the time you can't see CO2 because it's invisible as a gas, but many people are familiar with its solid form, a mainstay of several extraction methods: dry ice. The defining feature of dry ice is that it sublimates directly from a solid to a gas, skipping over the messy liquid stage — this is where the "super critical" part comes in. What do "subcritical" and “supercritical” mean? CO2 has no natural liquid state — at atmospheric pressure. But at pressures greater than 5.1 standard atmospheres, it becomes a "supercritical fluid," which has physical characteristics of both gas and liquid, allowing it to effuse through material like gas while retaining the solvent properties of a liquid. “Supercritical” CO2 extraction refers to extractions that occur beyond the “critical point” of carbon dioxide. Normally we think of CO2 in gas, liquid, or solid form. But past CO2’s critical point, the molecule ceases to exist as a typical solid, liquid, or gas. Supercritical CO2 looks like a very dense fog. Supercritical fluid has no surface tension. It moves through the vegetative material a gaseous state that and dissolves trichomes. Carbon dioxide’s supercritical state results from a combination of temperature and pressure. CO2’s supercritical range begins at 87˚F (30˚C) and 1070 psi. (By contrast, water goes supercritical at 700˚F [371˚C] and 4000 psi.) Supercritical fluid extraction (SFE) is usually performed at 800 to 5,000 psi. “Subcritical” CO2 extraction uses CO2 in its liquid state, below its critical point. Pressure of between 800 and 1500 psi is applied to CO2 at a temperature of 35˚F (2˚C)–55˚F (13˚C). The CO2 liquid is pumped through plant material and it dissolves the oils and terpenes. Then the CO2 is decompressed and returns to its gaseous state. The oils, consisting mostly of cannabinoids, terpenes, and waxes, precipitate out and are collected on a nearby surface. Supercritical fluid extraction has some advantages over subcritical (liquid) extraction. Supercritical fluids are faster extractors because of their low viscosities and high diffusiveness. CO2 is pumped through the extracting material 3 to 10 times using supercritical, rather than 10 to 40 times using subcritical. Another advantage is that it can be used to select particular molecules for extraction by manipulating pressure and temperature. The downside is supercritical fluid CO2 reacts with moisture to form carbonic acid at pressures over 5000 PSI, which can turns oils rancid. For this reason, all material used for extractions must be completely dry. 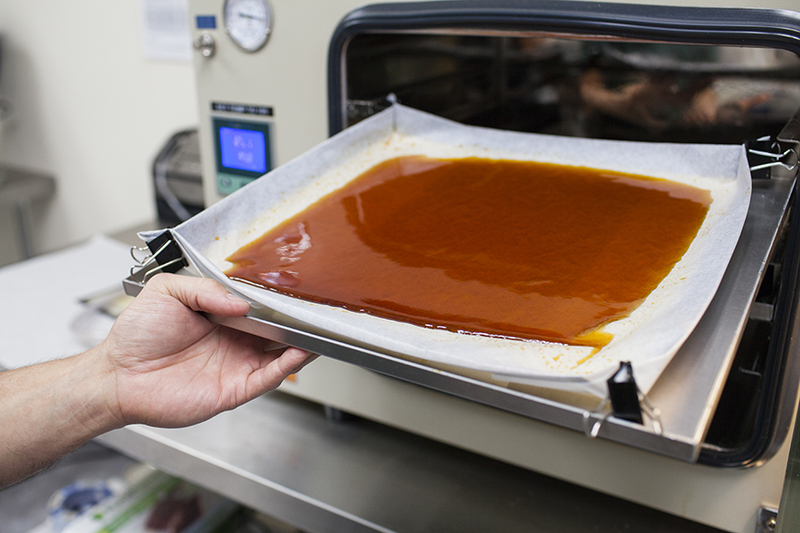 Extract artists exploit the physical properties of liquid and “supercritical” CO2 to extract and concentrate cannabinoids found on marijuana plants. The machines are expensive require several days of training to learn how to operate, but have a number of advantages. Large extraction companies are turning to CO2 because of the proven efficiencies of CO2 when processing industrial converts large amounts of leaf and trim into some of the cleanest, most valuable medical grade cannabis products in the world. CO2 extracts are four to five times as concentrated as the best buds yet they can be inhaled without the irritation of smoking raw cannabis. CO2 extracts can also be used to make super-potent edibles, topicals, smokables and other marijuana-infused products for the changing demographics in modern Cannabis applications. It's worth noting that CO2 extraction is a relatively slow process, with super critical CO2 extraction taking 8-10 hours versus one hour or less for butane extraction. And while techniques and technology are always evolving, SCCO2 extraction generally strips way more desirable terpenes than other methods. That said, many extractors still create very flavorful products using CO2, it just requires more fine tuning of the process.